I’ve finished one playthrough of Borderlands 2 and I’m in the middle of a second. (I previously gave some early impressions, and also discussed the game’s interesting partial embrace of immortality.) I’m mostly doing it single-player as Ash is busy right now, which is fine because I can be a lot more leisurely in single-player mode, and appreciate the level design and dialog. For a shoot ‘n loot, BL2 has quite a lot of characters and story. I sometimes wonder why the planet only has one to four persons who can actually accomplish anything, from delivering packages to taking out evil megaCEOs, but that’s common to almost all video games (with the notable exception of Stalker). Strangely, it seems that they’ve greatly reduced the number of guns you find. In BL1 there’d be crates all over the place; here they’re fairly rare, and enemies don’t drop as many either. One big personal complaint: of the four player classes, I only like one, the Siren. That’s one third as many as in BL1. 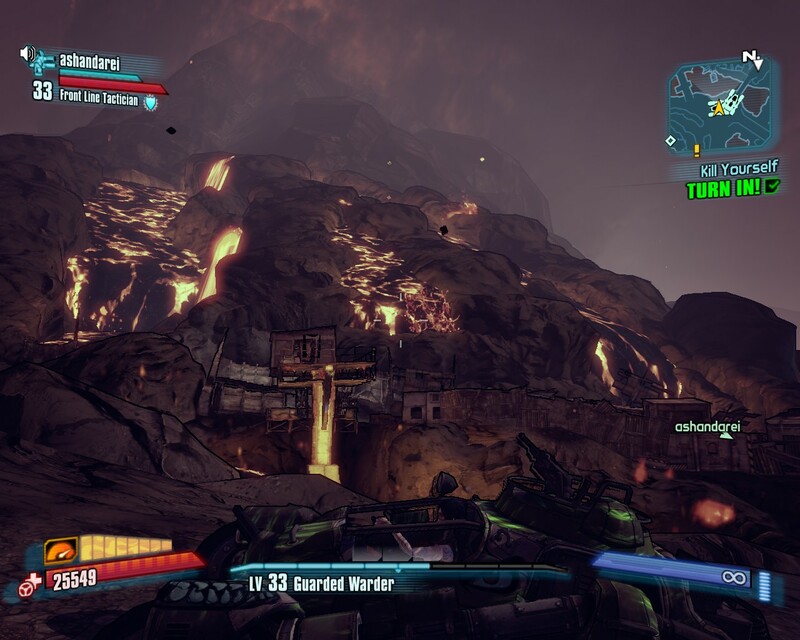 In BL1 I also liked Mordecai and his Bloodwing, and Brick’s fist berserker mode. I tried Zer0 but a) his special skill seems really lame, at least at low levels, and b) he talks annoyingly when he does it. I should try Gunzerker, but it sounds dumb– the rest of the game is all about guns, it’s better when the skills are not more guns. In both games I found deploying a turret boring. Well, there’s a new class coming later this month. Many of the voices, the music, the dark anti-PC humor, as well as the general emphasis on guns and good times, give both games a kind of Southern atmosphere. Or maybe Texas, given the harsh desert climate in most of the maps.